Sick of feeling sick? So are we. 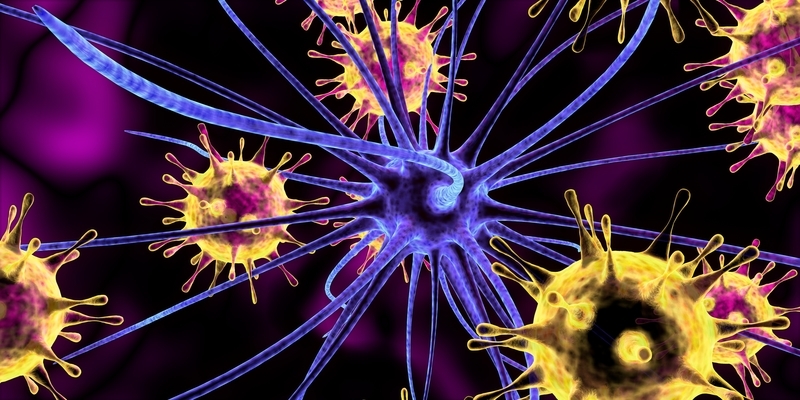 Learn everything there is to know about viruses, including how to stop them in their tracks. Above: A 3-D rendering of a nerve cell attacked by virus. Our bodies can be resilient at fighting off viruses, but it's best to take safeguards against contracting them in the first place, as our author describes here. Welcome to the new season of America’s Got Viruses. From a common cold to Zika, viruses from all over the globe are competing to infect the highest number of host cells. While some viruses are mild, gifting us with symptoms like a runny nose and sore throat (we feel you, cold and flu viruses), others have more severe consequences such as inflammation of the heart or brain. Remember the Ebola outbreak? How about SARS (severe acute respiratory syndrome), the swine flu, and HIV? They’re all viruses. Don’t worry. You don’t need to hole up at home in a face mask anytime soon. Just because you’ve been exposed to a virus doesn’t mean you’ll get sick. Much of the time, your immune system can fight off a virus before it makes you ill. You may not even know you have one. Still, it’s always good to be informed, so here’s your guide to viruses and what you can do to prevent them. The word virus derives from Latin, meaning “slimy liquid” or “poison”—pretty fitting considering some of the nasty side-effects they produce. Viruses are tiny, highly infectious microorganisms, or germs. They consist of nucleic acid (either DNA or RNA, but never both) housed inside a protein shell. While there is much debate over whether viruses are alive, most scientists believe they are inanimate. The reason: Viruses can’t thrive or multiply without glomming on to, and inherently taking over, a living host cell. As we mentioned earlier, viruses contain DNA or RNA inside their protein shells. Once a virus encounters a living host cell (animal, plant, or human), it launches its attack. The virus hijacks the healthy cells (these can be pretty much anywhere in the body—e.g. the liver, lungs, or blood), inserting its DNA or RNA. The virus then uses the cell’s energy to replicate itself and spread. In the process, it may kill, damage or change host cells, which can cause sickness. What is the difference between viruses and bacteria? Bacteria are microscopic, single-celled organisms measuring a few micrometers in length. As tiny as they seem, however, they are still 10 to 100 times bigger than viruses. Bacteria travel in groups of millions. Unlike viruses, which can reproduce only after they’ve hijacked a living cell, bacteria can survive on their own both inside and outside other organisms. Sometimes, they can even subsist in extreme conditions such as intense heat or moisture. Most of the time, bacteria don’t cause harm to people, but in some instances, they can cause troublesome conditions like strep throat, urinary tract infections, and tuberculosis. In some cases, these can be successfully treated with antibiotics. The short answer is no. Antibiotics are successful only at treating certain types of bacterial infections (e.g., pneumonia caused by the flu virus). According to the Centers for Disease Control and Prevention, “about 30 percent of antibiotics, or 47 million prescriptions, are prescribed unnecessarily in doctors’ offices and emergency departments in the United States.” The effect: Some 2 million people are becoming infected with antibiotic-resistant bacteria in the United States each year. A whopping 23,000 of them are dying as a result. In most cases, your body’s best defense for a viral infection is your own immune system—even if you’re producing thick, yellow, or green mucous. Chances are, your body will kick into gear and beat that virus into submission. Just give it time, plenty of fluids, and rest. If your symptoms worsen or you have more serious underlying illnesses, such as asthma or a heart condition, see your doctor. How Can I Prevent Viruses from Making Me Sick? Get vaccinated. Kids aren’t the only ones who benefit from vaccines. As we age, our T-cells stop working as well as they used to. The result: weakened immune systems and a higher susceptibility to contracting diseases and infections that we can’t fight. Immunizations can help us avoid getting preventable illnesses. Wash your hands. This oldie but goodie is a simple way to prevent germs from monopolizing our healthy cells. Cover your cough. Sneeze and cough into your elbow, not your hand. That helps keep the germs contained. Use a tissue, not a handkerchief, when you blow your nose. Then throw it away immediately. Don’t share. For once, it’s okay to be selfish. Sharing cups or cutlery is a sure-fire way to catch something, especially during cold and flu season. Stay home. Do everyone a favor and keep your sickness to yourself. If you’re unwell, tuck yourself in with a warm beverage and Netflix. Clean up. Use disinfectant spray on doorknobs, telephones, TV remotes, sinks, and kitchen countertops to cut down contamination. antibiotics, asthma, bacteria, best flu remedies, brain, cancer, cold and flu, common cold, flu, flu remedies, germs, getting sick after flying, heart condition, immune system, infection, inflammation, pneumonia, protein, runny nose, sick after flying, side effects, sinus, sinus infection, sore throat, throat cancer, tuberculosis, viral infection, virus, west nile virus. Sometimes a supplement ,not recommended by the FDA gives excellent results,along with eating right exercising and rest ! I am not sure I understand. How can a non living organism launch an attack? If it does not live it can not die. Why does it not keep attacking?